The antiserum was produced against synthesized phosphopeptide derived from human JAK1 around the phosphorylation site of tyrosine 1022 (K-E-YP-Y-T). JAK1 (phospho-Tyr1022) antibody detects endogenous levels of JAK1 only when phosphorylated at tyrosine 1022. Zheng H, et al. (2005)Mol Cell Proteomics. 4(6):721-730. Wang R, et al. (2003) Arch Biochem Biophys. 410(1): 7-15. 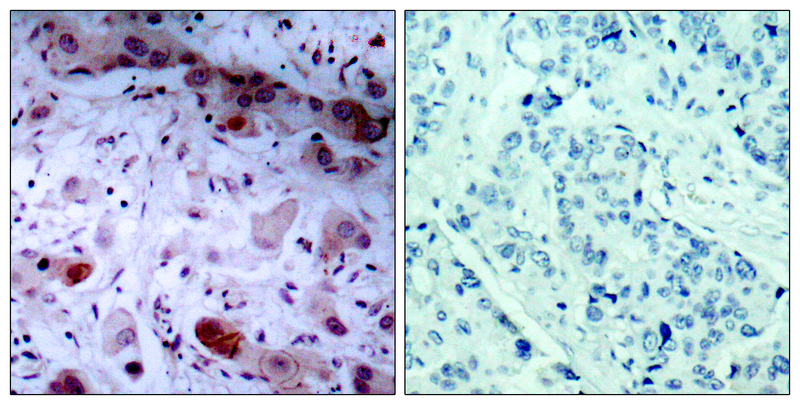 Immunohistochemical analysis of paraffin-embedded human breast carcinoma tissue, using JAK1 (phospho-Tyr1022) antibody (E011149). Western blot analysis of extract from thyroid cancer cell line Bph cells, using JAK1 (phospho-Tyr1022) antibody (E011149).